Valentines Day is only couple of weeks away. Yet, although it is nice to take one day out of the year to tell those you care about how much they mean to you, I don’t believe that should be kept for just one day. Showing people that we love and appreciate them should be an everyday occurrence. Not the insincere gushing of some, who say the word love too easily and yet have not the slightest comprehension of what real love truly is. No, showing love in a quiet, sincere way. A gentle loving way, so as not to embarrass those we care about. 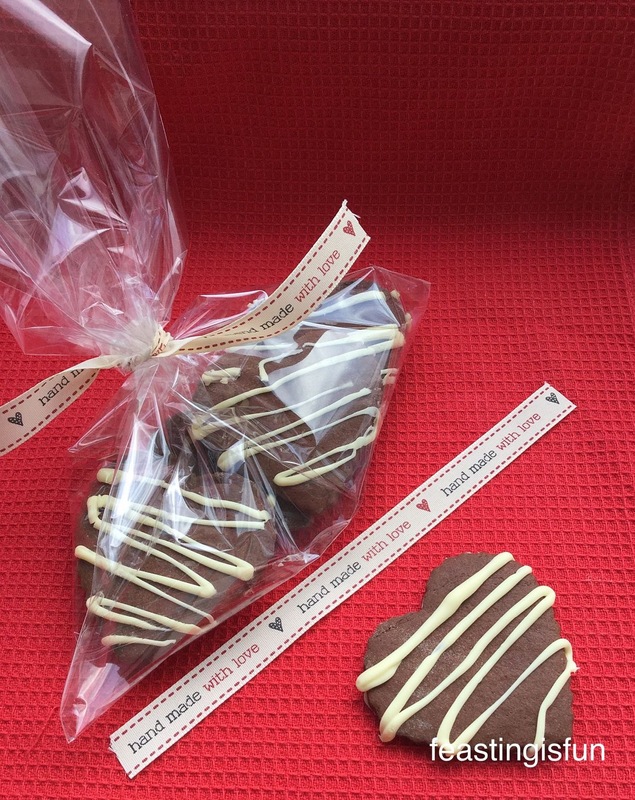 A few encouraging words, a hug, or a small token, such as these Chocolate Dipped Shortbread Heart Cookies. Since we are talking about love, did I mention how much everyone here at Feasting headquarters loves these cookies? Oh they do. 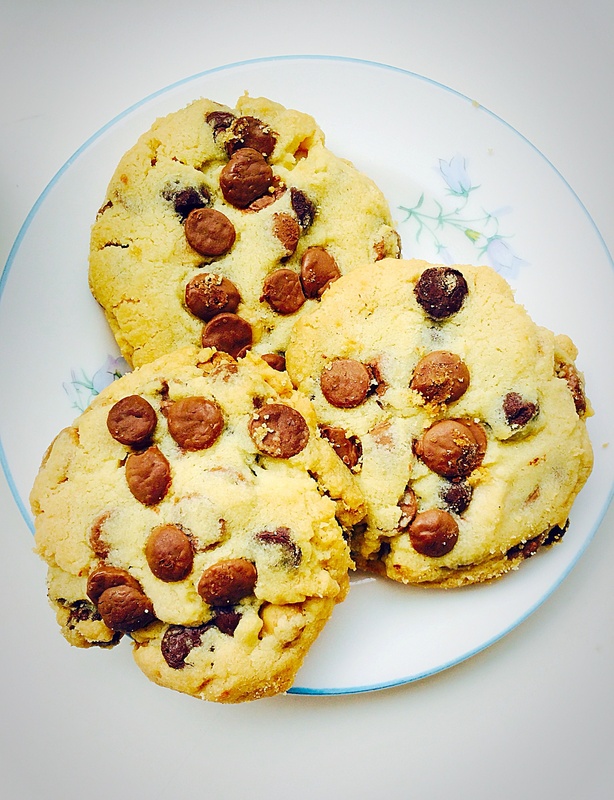 Rich, buttery shortbread with thick, milk chocolate on one half. 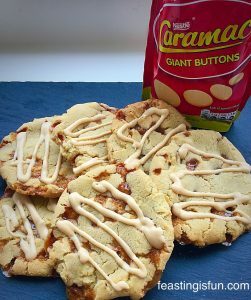 While these cookies are solid enough to be dunked in a hot drink, they also crumble beautifully on the tongue. 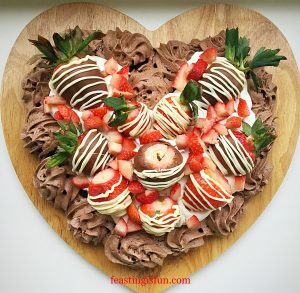 Not just a Valentines Day bake! Since I couldn’t find my collection of different size heart cookie cutters, my dear, late friend Pat, was here to help me. Amongst the baking items I had been given by her family was a perfect sized heart. Smaller than I had initially wanted for this recipe, it turned out to be the perfect size. Each cookie being exactly the right size. Use whatever size cutter available to you. 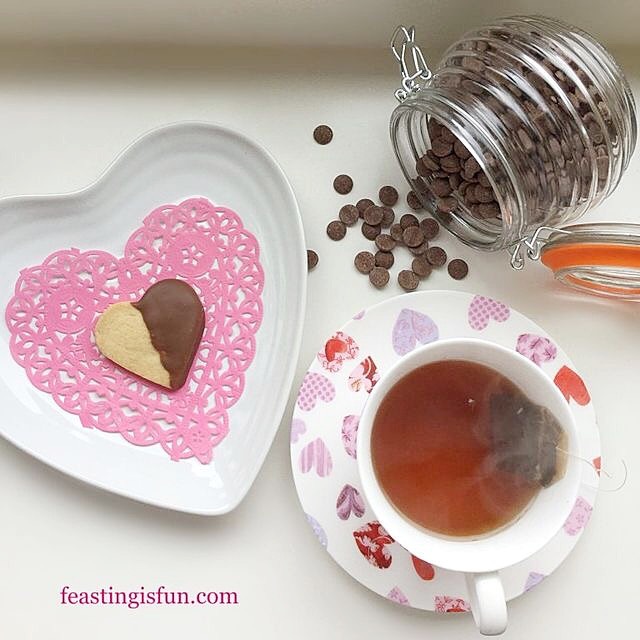 The recipe yielded 40 cookies using a 5cm x 5cm heart shape cookie cutter. First of all add the butter, caster sugar and salt to a large bowl. 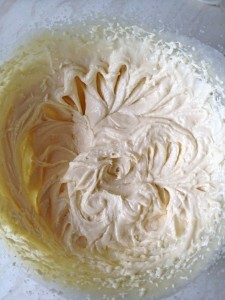 Whisk together until fully combined, pale and creamy in appearance. Add the vanilla extract and whisk again until combined. 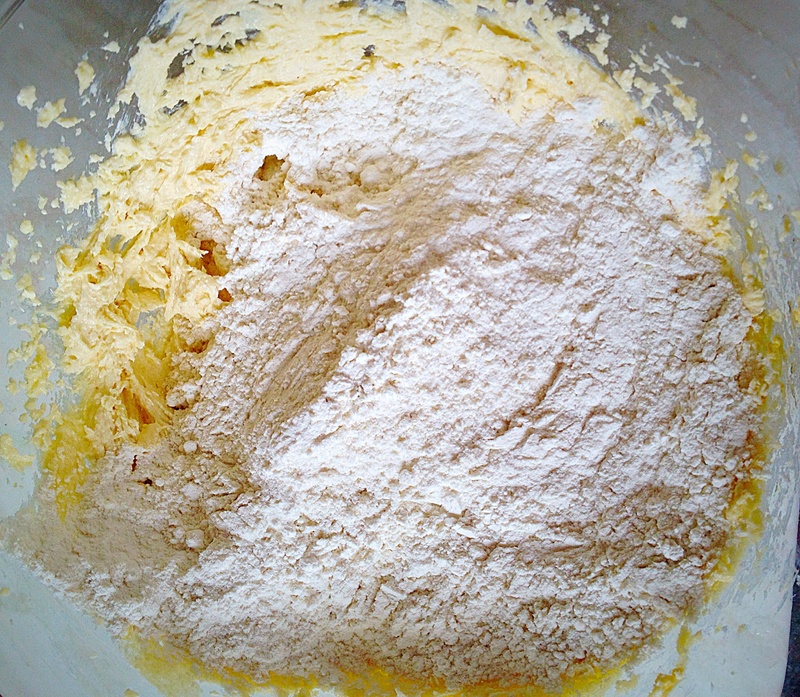 Sift the plain flour and corn flour into the bowl together. Using a spoon gently mix the ingredients until it comes together in clumps. Wipe the worktop with a damp cloth and lay a large piece of cling film on to the damp surface; it will stick to the worktop. With clean hands bring the dough together into a ball. 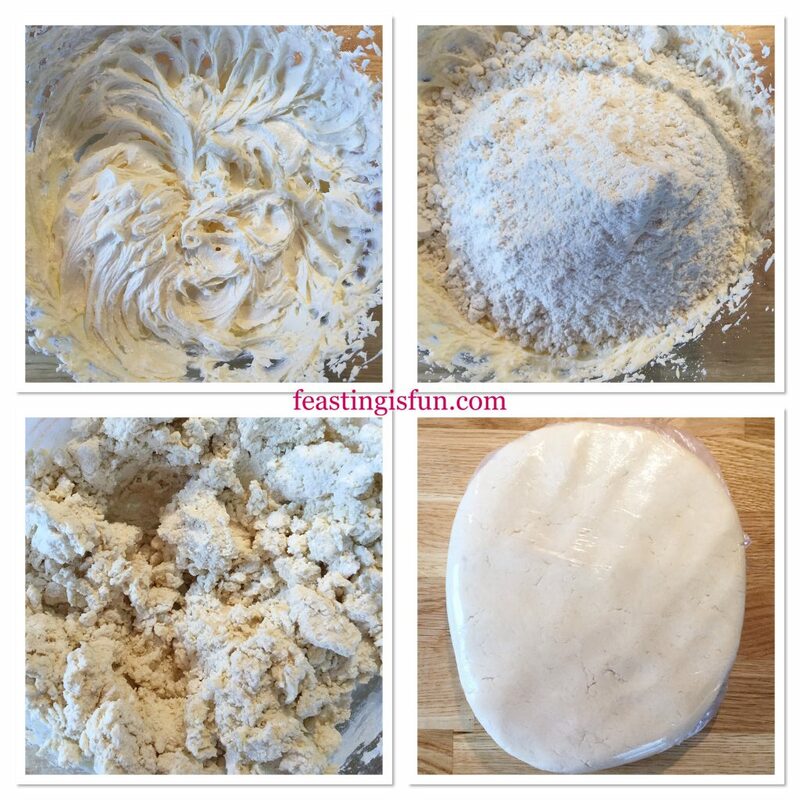 Place the shortbread dough on to the cling film and wrap into a disc shape. Chill the dough in the fridge for at least 30 minutes. While the dough is chilling line 2 large baking trays with baking parchment paper. 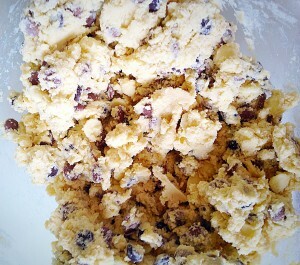 As soon as the dough is chilled remove from the fridge. Knead lightly and then roll out the dough between 2 pieces of parchment paper. Roll to a thickness of 5mm. 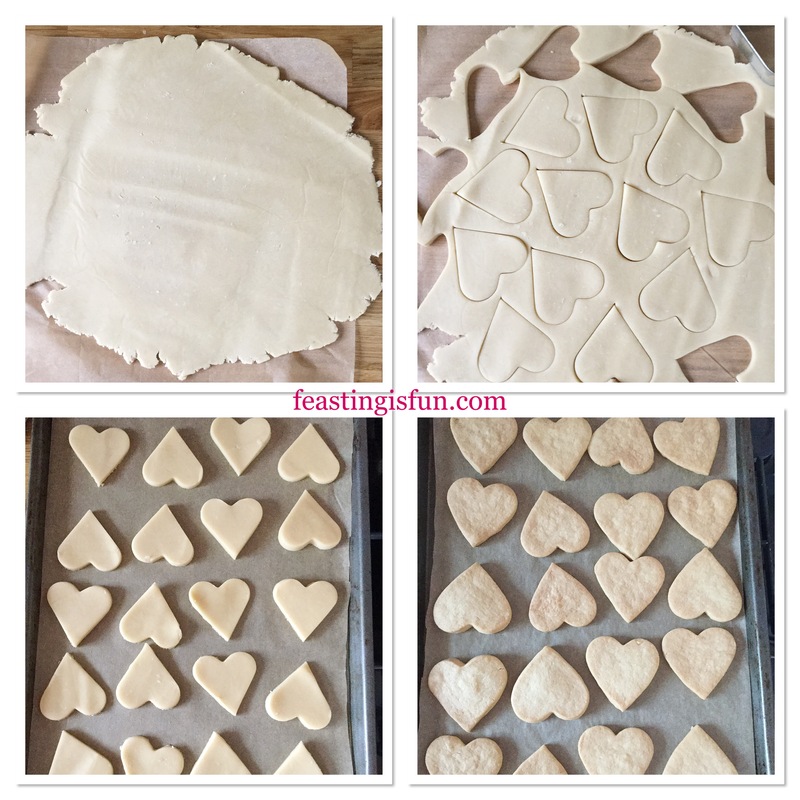 Using a heart cookie cutter cut out the first batch of cookies. Placing them carefully on to the baking tray. Because the dough is cold the cookies do not spread on baking, so they can be placed close together on the baking tray. As soon as the baking trays are full place them into the middle and lower shelves of a preheated oven. Bake for 20-25 minutes until they are a pale golden brown. 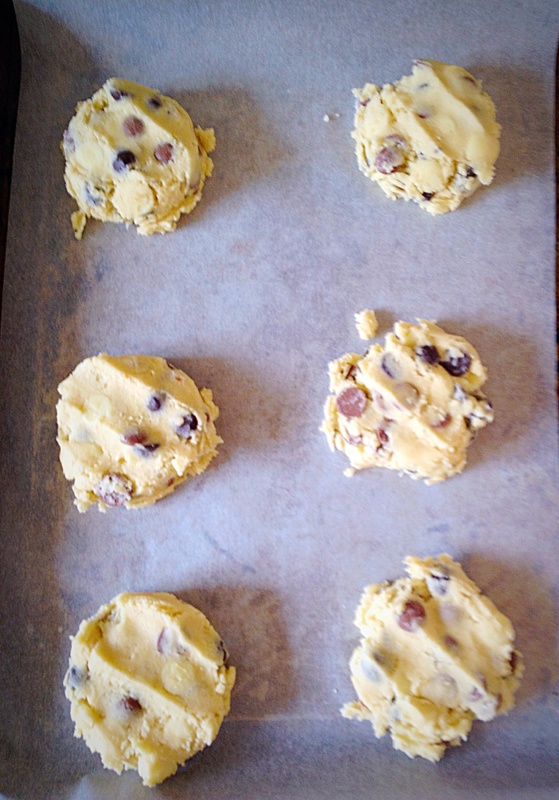 Baking time will depend on the size and thickness of the cookies. While the shortbread is baking gather together any remaining dough, wrap in cling film and chill. 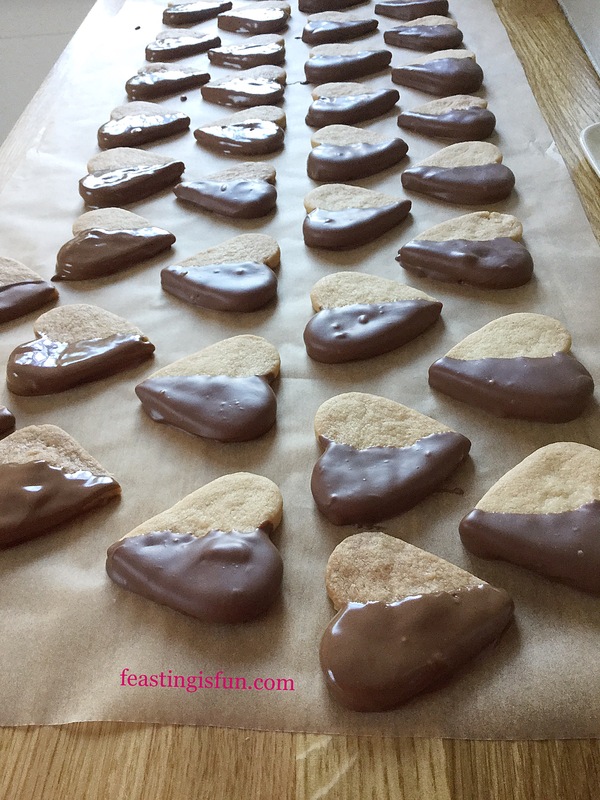 Once baked remove from the oven, allow to cool for 5 minutes on the tray and then transfer the shortbread hearts to a cooling rack. Allow the baking trays to cool completely. Flip over the baking parchment on each tray and using the chilled dough proceed to roll out and cut out the cookies as before. Laying them on the baking trays and baking as before. 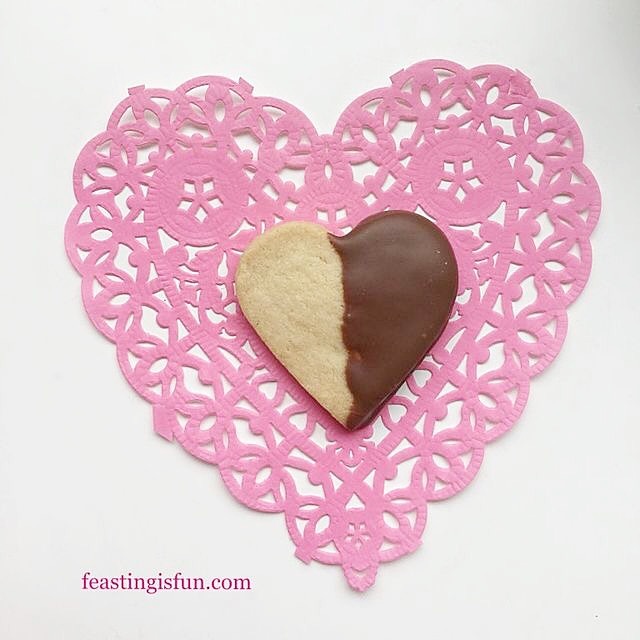 Cutting out the shortbread hearts. Cool the shortbread hearts completely before the next step. Chop up the chocolate and place into a microwaveable, heatproof bowl. Place in the microwave and heat on medium power for 30 seconds at a time, stirring after each burst. As soon as the chocolate starts to melt remove the bowl and stir continuously until all of the chocolate has melted. An extra burst of heat in the microwave may be needed to ensure the chocolate is completely smooth. 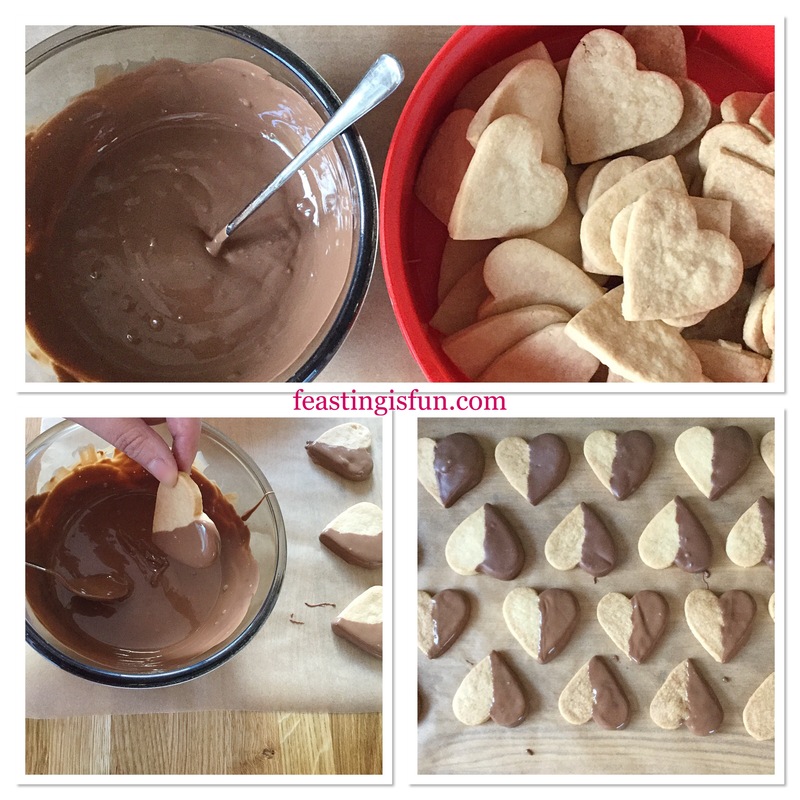 Dipping the shortbread hearts in melted chocolate. Lay a long strip of baking parchment on to the worktop. 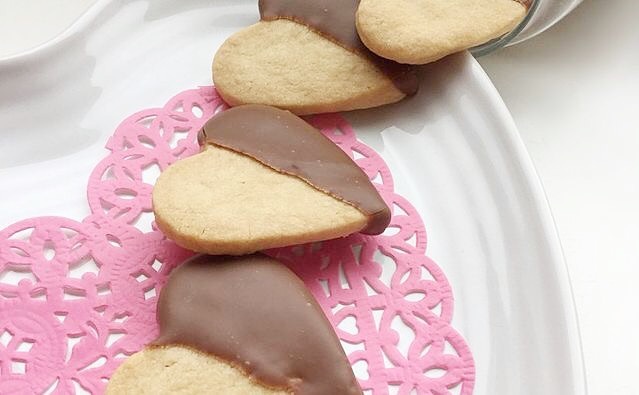 Take one shortbread heart at a time and hold on the opposite side that is to be dipped. 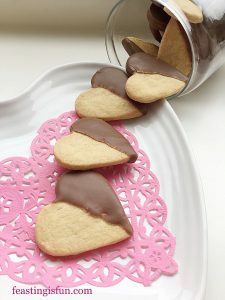 Carefully dip the shortbread into the melted chocolate, using a spoon (a long handled sundae spoon is ideal) to help cover one half of the cookie completely in chocolate. 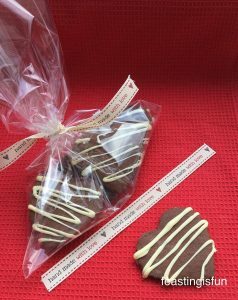 Allow any excess chocolate to drip back into the bowl, then place the chocolate dipped heart on to the baking parchment. 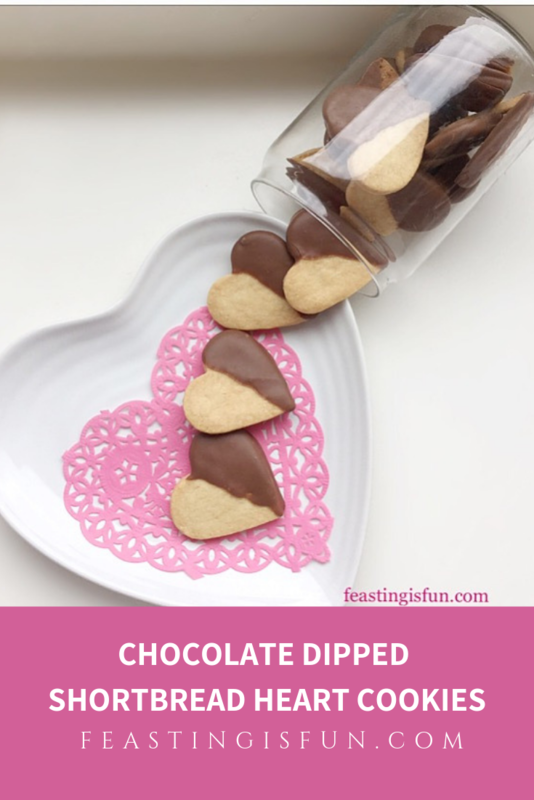 Continue this process until all of the cookies have one half completely dipped in chocolate. If necessary, halfway through the process, place the chocolate back into the microwave for a 20 second heating burst, to ensure the chocolate remains fluid enough to easily work with. 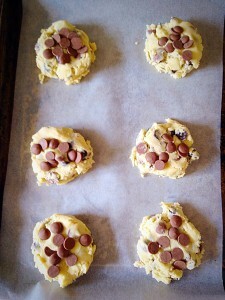 Once finished leave the chocolate to set completely on the cookies. 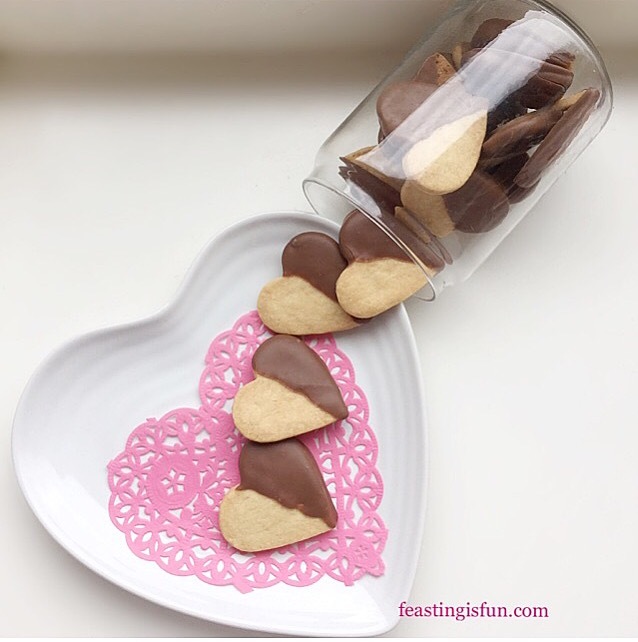 Chocolate Dipped Shortbread Heart Cookies. 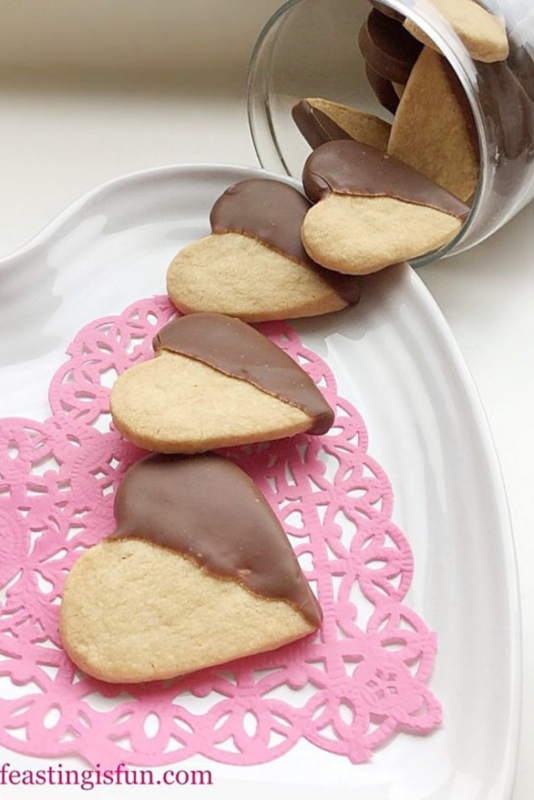 Store the finished shortbread hearts in an airtight container. Share these cookies with those you love. Package a few in a small cellophane bag, tied with pretty ribbon and give as gifts. Eat within 5 days, if they last that long! Showing appreciation and love in a way suited to the recipient is a gift in itself. Either a small thank you, a handwritten note, even a text, sent in love is how we share our feelings with others. While not done for our benefit, it is good for us too. Even when the emotion felt is gratitude, not love, it is good to express thanks. Surely the gift of love is the best gift ever? See Important Stuff. Does anyone still have chocolate left over from Easter? If so I have the perfect way to make it go further AND taste even more yummy. 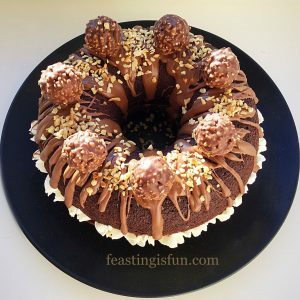 Meet my Chocolate Toffee Crunch Bundt Cake. Chocolate Toffee Crunch Bundt Cake such an easy, yet beautiful cake. The utterly mouth watering combination of Chocolate and Toffee all in one cake. 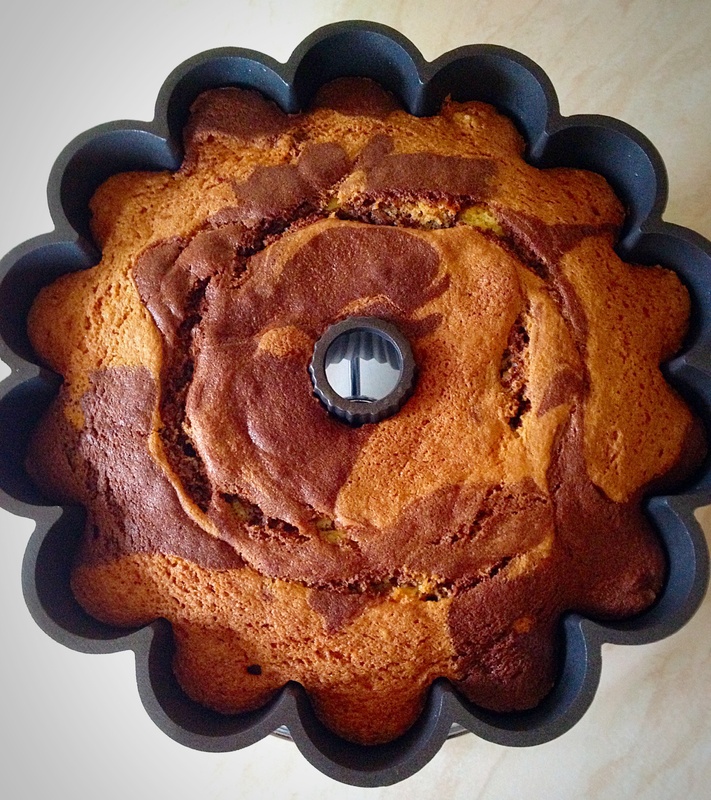 If you enjoyed my Rolo Chocolate Cookies I’m pretty sure you’ll love this cake! She is a beauty isn’t she? This Chocolate Toffee Crunch Bundt Cake is baked in the Nordic Ware blossom Bundt tin, so I decided that this cake is a girl. Well female….. oh dear it’s late, I’ve gone off on a tangent and I’m waffling again!! Chocolate Toffee Crunch Bundt Cake topped with milk chocolate and bronze crunch. So what is it that makes this cake so easy?? Wright’s Baking Chocolate Fudge Cake Mix and their Toffee Cake Mix, combined. The gorgeous fudgey chocolate works so well with the toffee, I honestly can’t believe that I didn’t think of it sooner. 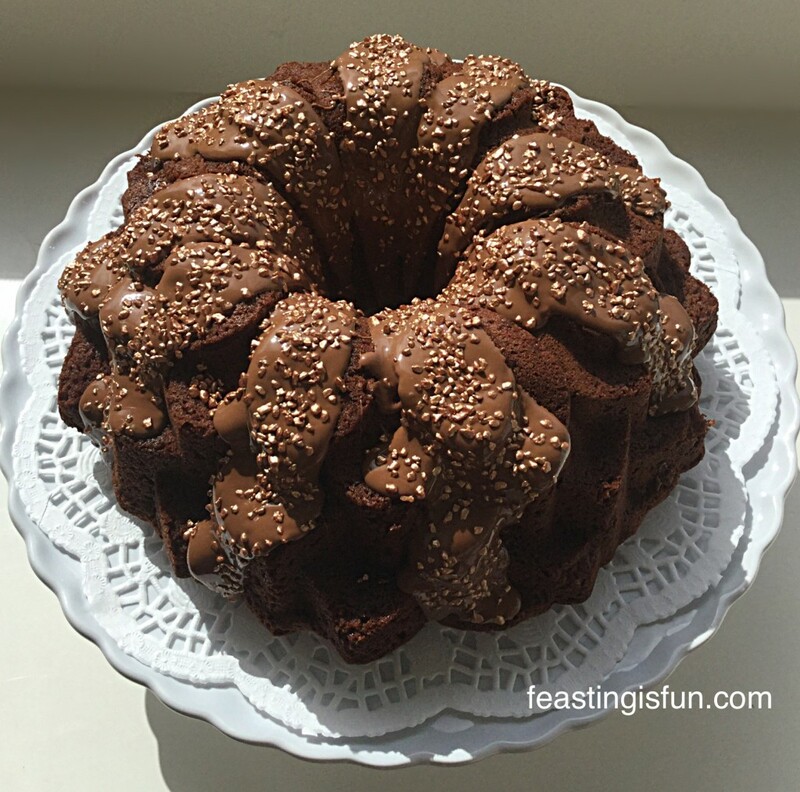 Chocolate Toffee Crunch Bundt Cake would like a slice – or two? So you have a choice: weigh out 3/4 of each packet mix (375g) add together and make up according to adjusted packet instructions: 150ml per mix = 300ml of water and 3 tablespoons of oil per mix = 6 tablespoons. Or mix both whole packets together and make up according to double the packet instructions. So 400ml of water and 8 tablespoons of oil. 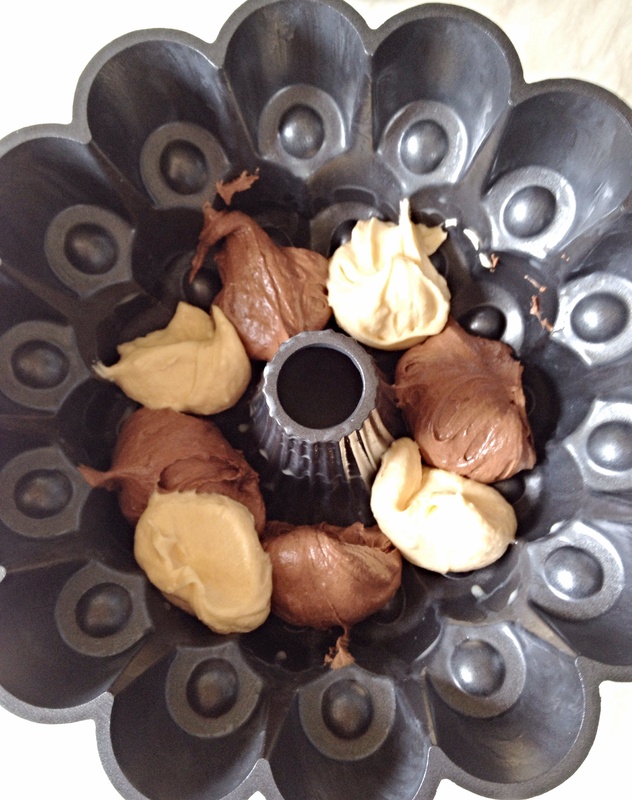 Fill the Bundt to the desired level and use the leftover batter to bake some cupcakes. Altenatively, a 10″ springform cake tin would be the right size to bake 2 complete packets of mix made up as per option 2. So many choices!!! I would like to add that investing in one Bundt tin is worth it, especially if cake decorating skills are not your strongest gift. 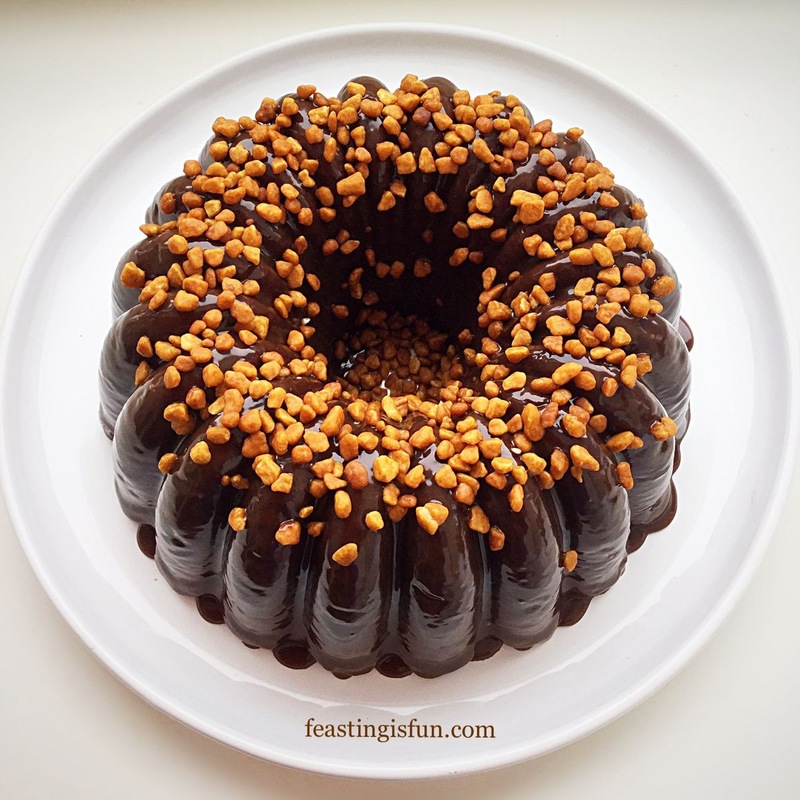 The tins really do make any cake look beautiful, including this Chocolate Toffee Crunch Bundt Cake. Toffee Sprinkles or the Bronze Crunch which I bought from Waitrose – or a Crunchie bar broken up. Decide which option you will use to bake your cake. 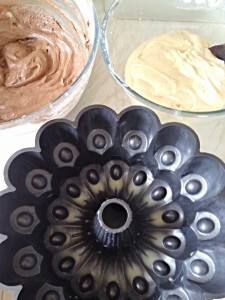 Prepare the Bundt by spraying with cake release. 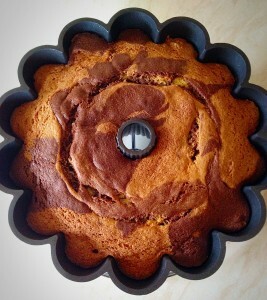 Alternatively grease and line a springform cake tin. Into a large bowl add the required amount of water and vegetable oil. Add both the chocolate fudge and toffee packet mixes – remembering to weigh out 375g ONLY, from each packet if using Option 1. Whisk according to packet instructions. 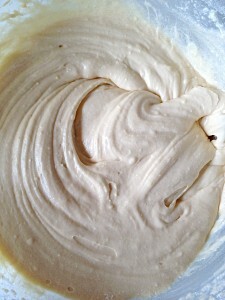 Pour the chocolate/toffee cake batter into the prepared tin. The Bundt tin should be no more than two thirds full. Place the Bundt tin in the middle of the oven and bake for 45-50 minutes – note: the baking time will be longer if using more cake batter. The cake is cooked when an inserted skewer comes out clean. 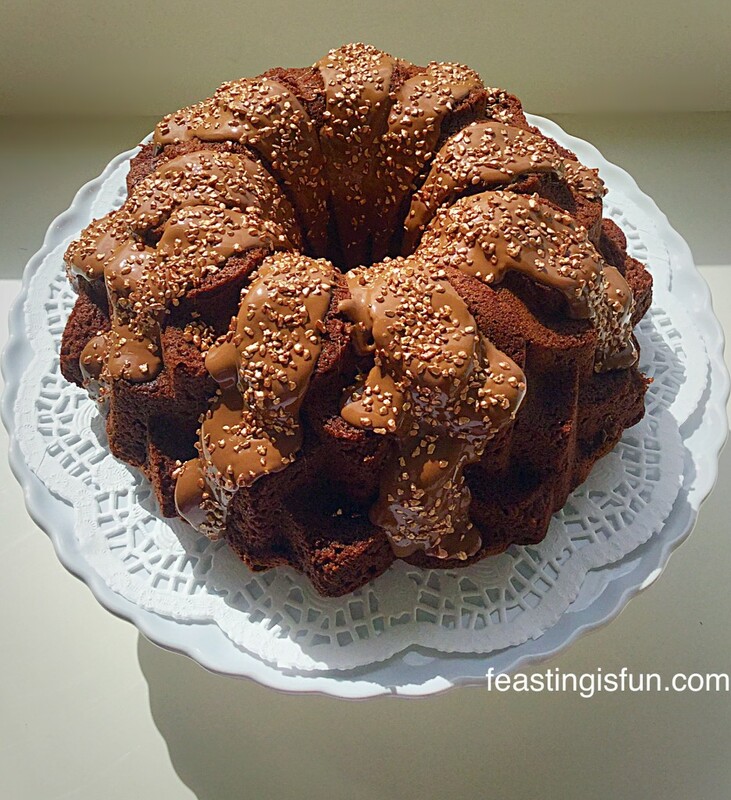 Chocolate Toffee Crunch Bundt Cake beautifully baked. 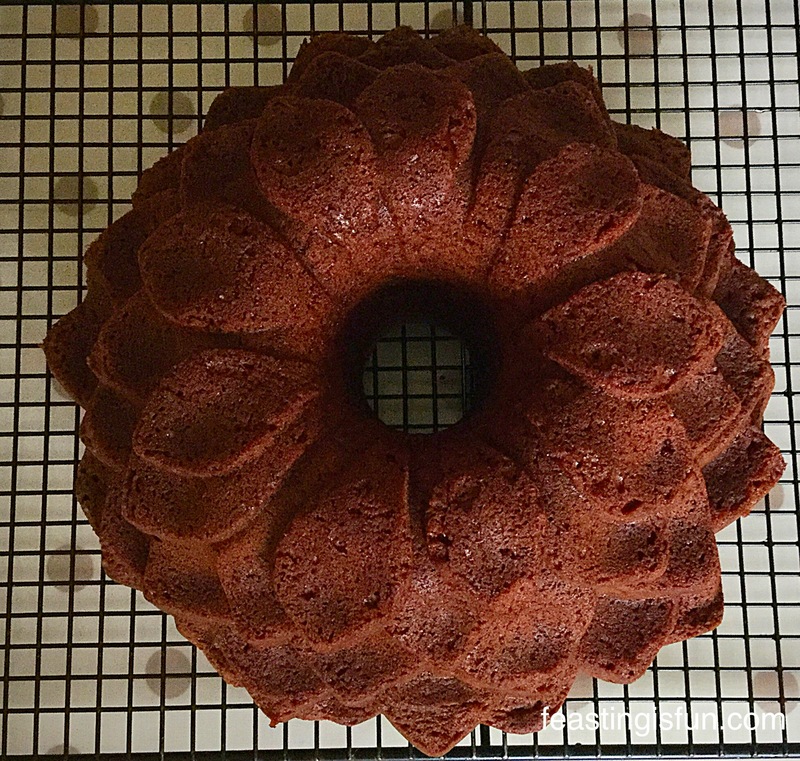 Allow the cake to cool in the Bundt tin for 10 minutes. Place a cooling rack on top of the cake and flip over. 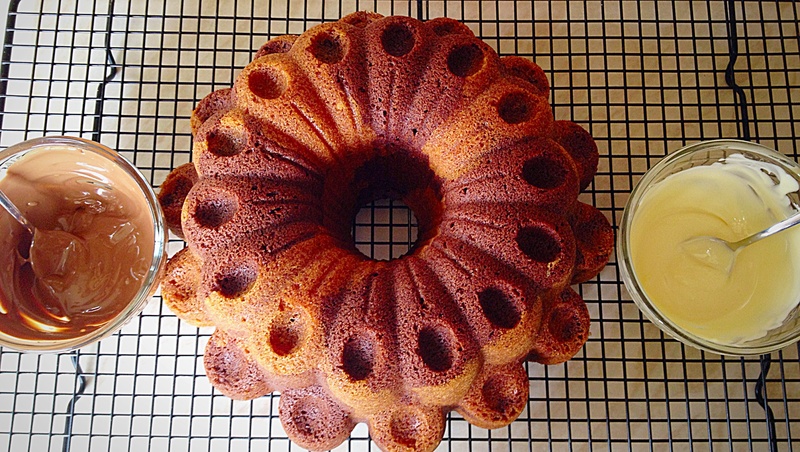 Remove the Bundt tin and admire the beautiful cake! 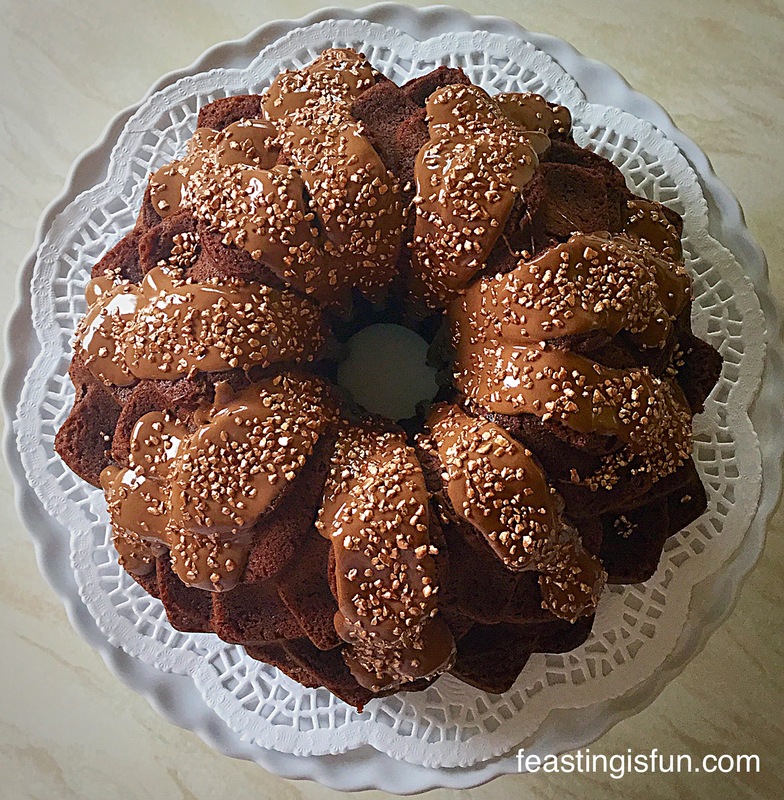 Chocolate Toffee Crunch Bundt Cake the blossom revealed. Break up the milk chocolate and place into a heatproof, microwaveable bowl. Zap for 30 seconds at a time in the microwave, stirring after each zap! When the chocolate is almost melted, remove from the microwave and keep stirring, until it is completely melted. 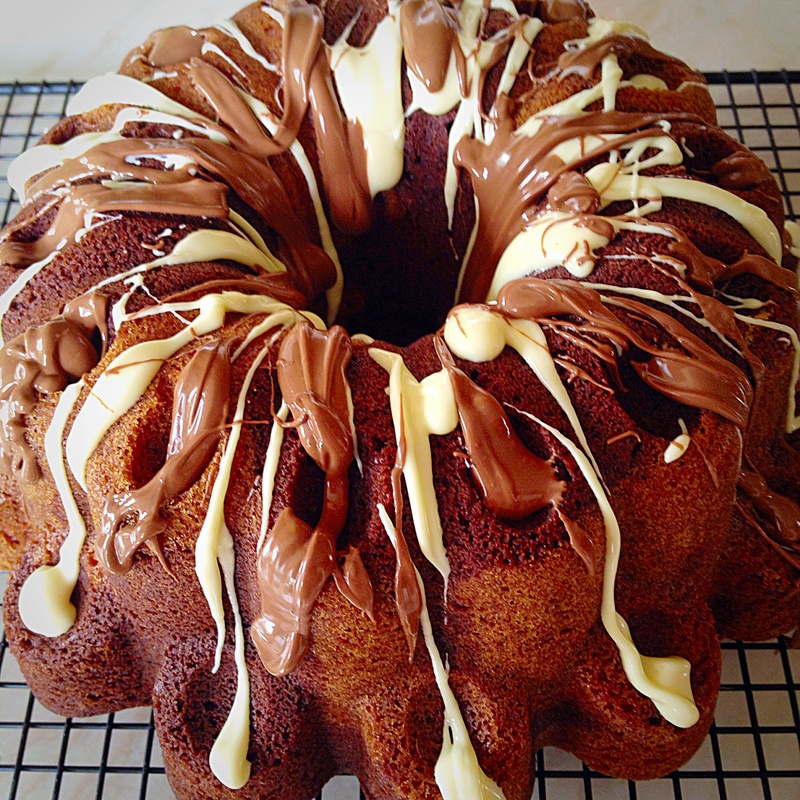 Use a spoon to drizzle the chocolate over the Bundt cake. Finish with some delicious sprinkles. Crushed up Crunchie bars would work beautifully with this cake. 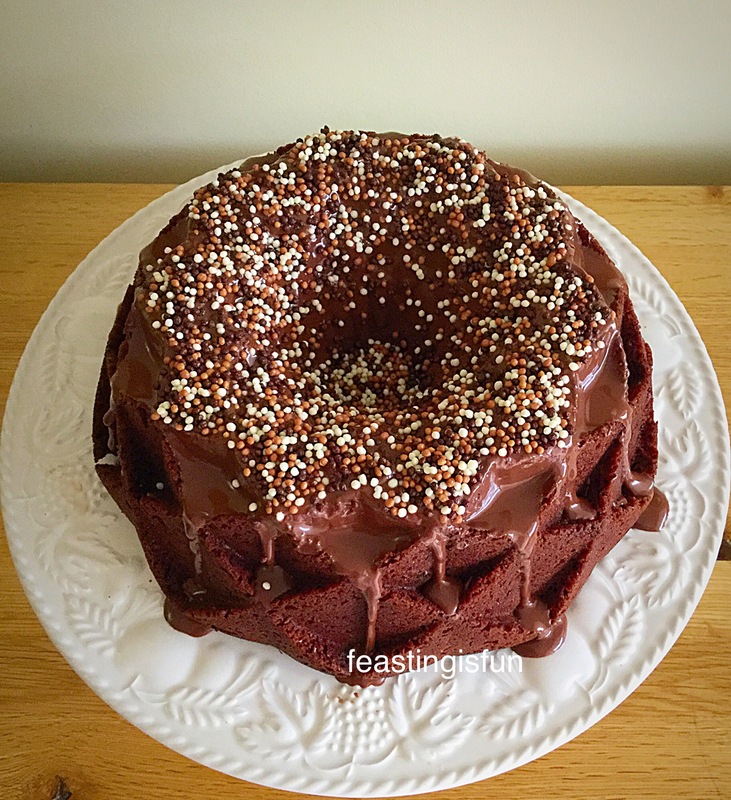 Chocolate Toffee Crunch Bundt Cake topped with chocolate and crunchy sprinkles. Allow the chocolate to almost set before serving. 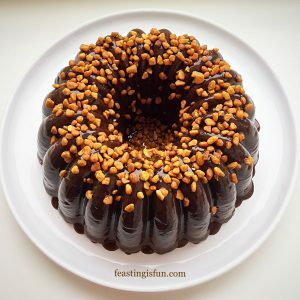 The combination of toffee pieces and the delicious chocolate fudge work together so well in this Chocolate Toffee Crunch Bundt Cake. 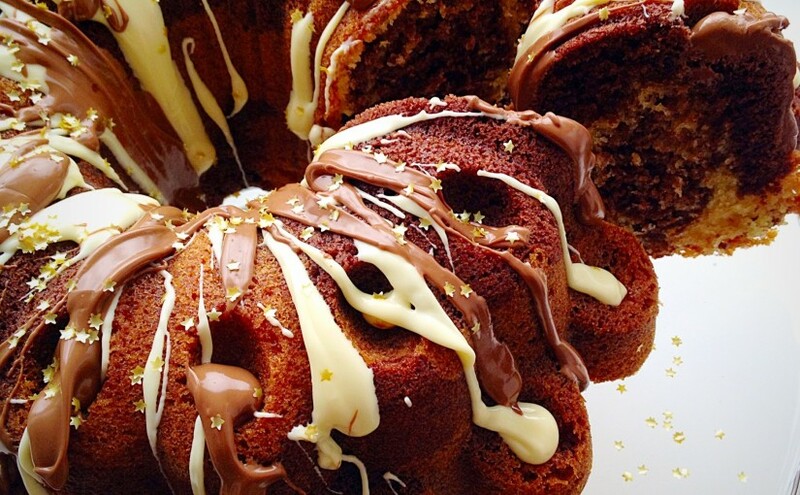 Have you caught the Bundt bug? Lemon Blueberry Bundt Cake with lemon glaze. 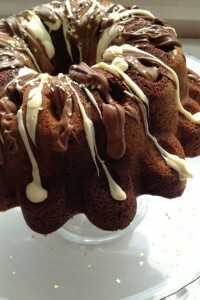 The Chocolate Toffee Crunch Bundt Cake was given to very dear friends, who had just lost a loved one. Simply making and giving a cake, during a time of grief, is one way to show you care. Nothing can replace their loss, or mend their heartbreak, but taking time to bake a cake, which they can then share with visitors, brought a smile to our friends face when it was delivered. 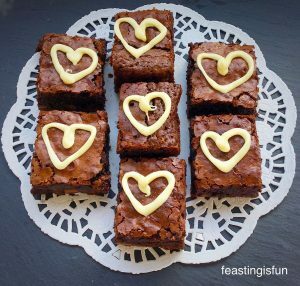 Do you bake for others to show your love? Wright’s Baking provided the cake mixes for this recipe. All opinions, content and photographs are my own. Please see my Disclosure Policy. Hello, welcome to my blog. I’m back after a couple of weeks off with our family, during which we celebrated our eldest daughter’s 16th birthday – erm where did those years go? Anyway, I digress. Because it was a wonderful holiday, especially as we were joined by family for a few days over the birthday celebrations. 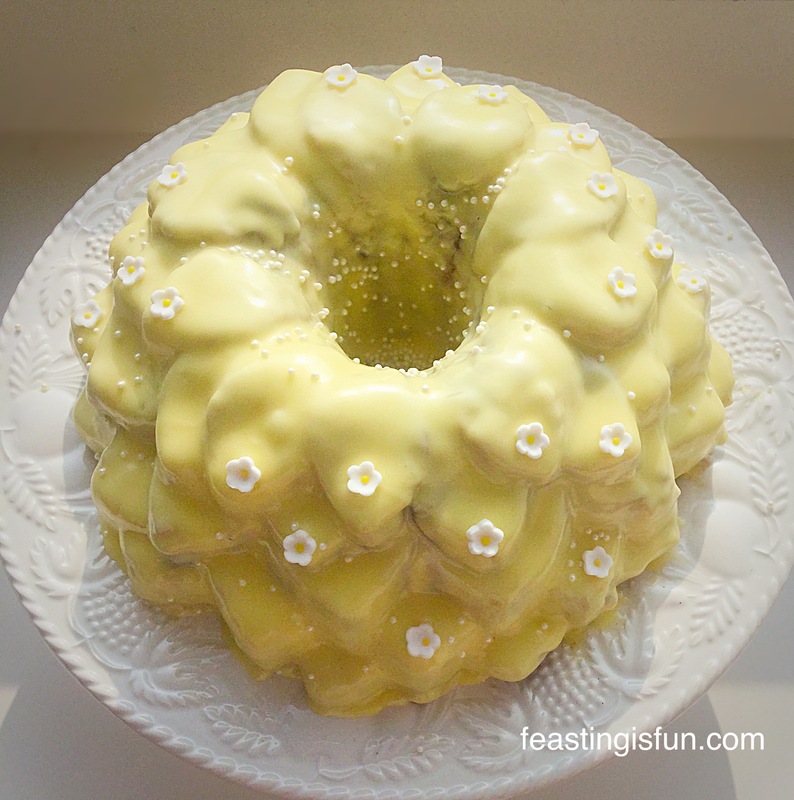 So I took my spring form cake tin with me – doesn’t everyone?? Star had a maltesers ice cream cake on her birthday, which was knockout! Buuutt now we’re home and there are other family members to celebrate Star’s birthday. Since I know her favourite cake is Chocolate Marble and she’s not a big fan of icing, I decided to make her a Marbled Chocolate Bundt Cake. Ooh you are going to be so pleased I came up with this cake!! See – I thought you’d be pleased. This is the second recipe I have made where I use plain flour and add the baking powder seperately. Also I guessed all the quantities for the size of cake (I mean, I did have a rough idea!!). 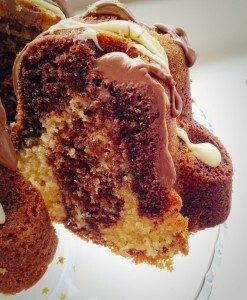 This Marbled Chocolate Bundt Cake was a complete success, both visually and in the taste department. 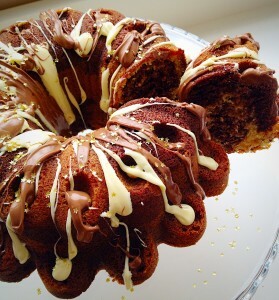 Marbled Chocolate Bundt Cake – drizzled with chocolate and sprinkled with edible gold stars. Most importantly to me though was that the birthday girl herself liked it. Tick box – result!! This cake has a wonderfully moist texture, resulting in most of it being consumed on the day of baking. 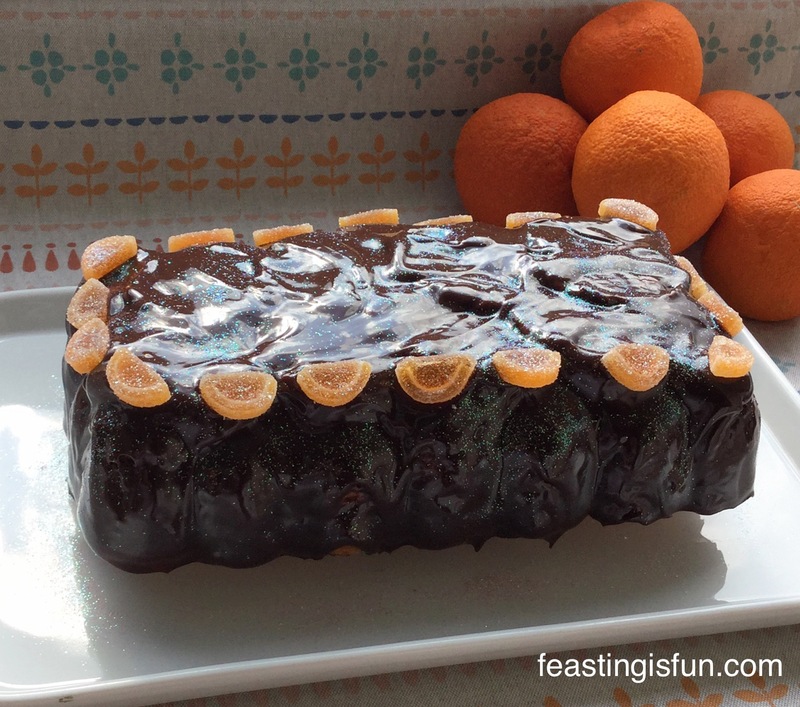 The drizzled chocolate adds different flavours and texture, overall this cake is a stunner. Perfect as a Celebration cake. 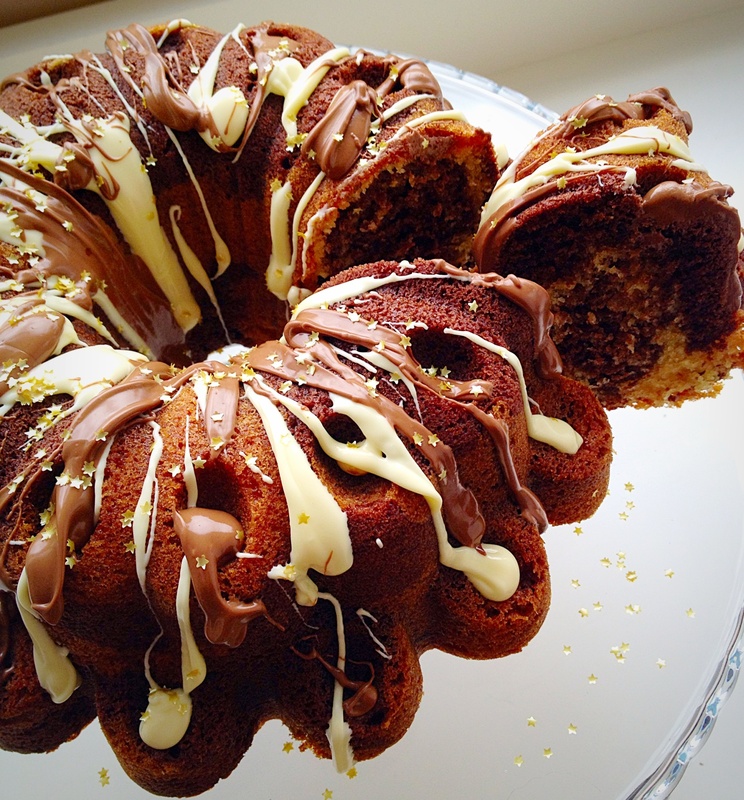 Marbled Chocolate Bundt Cake – each slice shows the beautiful marbling. 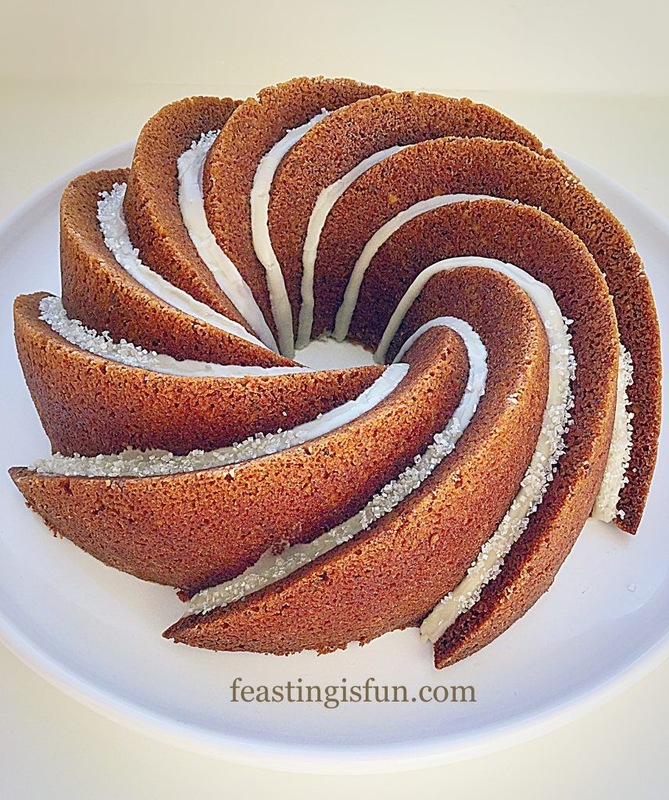 I absolutely am falling in love with Bundt cake pans. Who wouldn’t?? They give such beautiful detail to the baked cake. I was very tempted to put Maltesers into the little dimples on the cake, but thought that it looked better with just the drizzled chocolate. 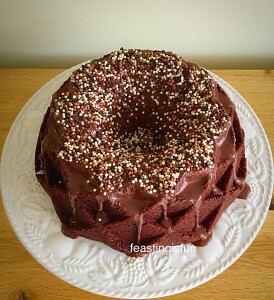 However, if I was baking my Malted Marbled Chocolate Cake I absolutely would – maybe sprinkling a few crushed Maltesers over the top as well?? The possibilities with decorating a Bundt cake are endless, as the cake shape lends itself to all sorts of ideas, including leaving the cake plain. 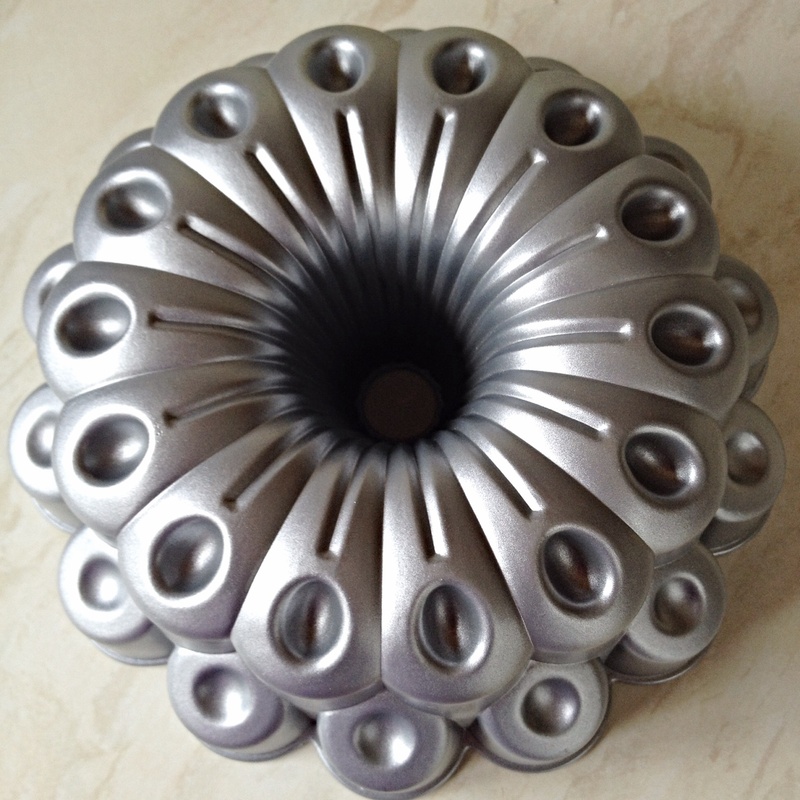 This is the Bundt tin I used. Soo gorgeous I know. I’m even toying with the idea of making a jelly in it – can you imagine?? Have you ever tried making a jelly in a Bundt tin? I’m guessing you’d have to lightly oil the inside of the pan with a flavouless oil, but I think it could totally work. I’ll keep you posted! Anyway enough about glorious Bundt pans and onto how to make this cake!! 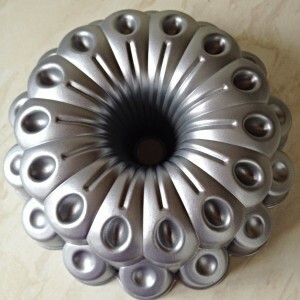 Firstly the Bundt pan dimensions are 23.5cm (9″) wide x 11cm (4.5″) deep. The pan holds 3 litres (5.3 UK pints). Using a pastry brush, ensure the inside of the Bundt tin is covered in melted butter. Whisk the sugar, butter, salt and vanilla extract until light and creamy. Crack all the eggs into a jug. 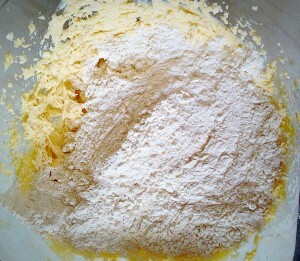 Sift the flour and baking powder together in a separate bowl. Starting with the dry ingredients add a third to the butter mixture, followed by half of the eggs, beating gently to incorporate the ingredients. Repeat this step. Finish by adding the final third of the dry ingredients and beating to mix. Add the milk and mix to incorporate. Give the ingredients a good mix with a spatula to ensure everything is well incorporated. 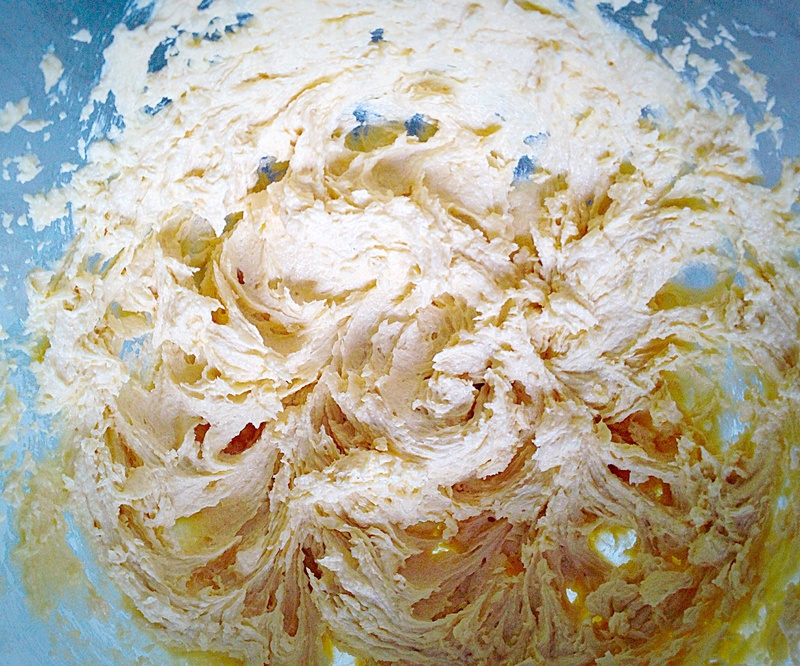 Remove half of the cake batter to a separate bowl. This will be the vanilla part of the cake. 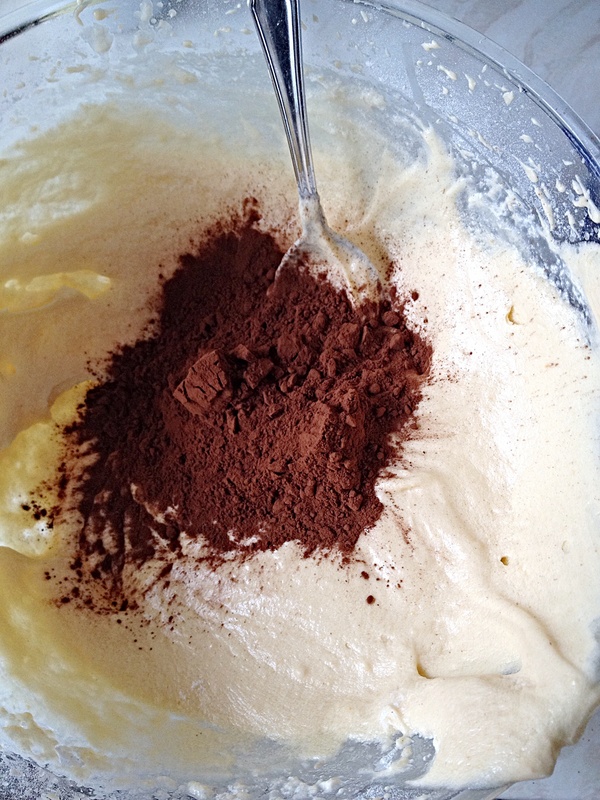 Add the cocoa to the remaining half of the cake batter. Mix well to incorporate. 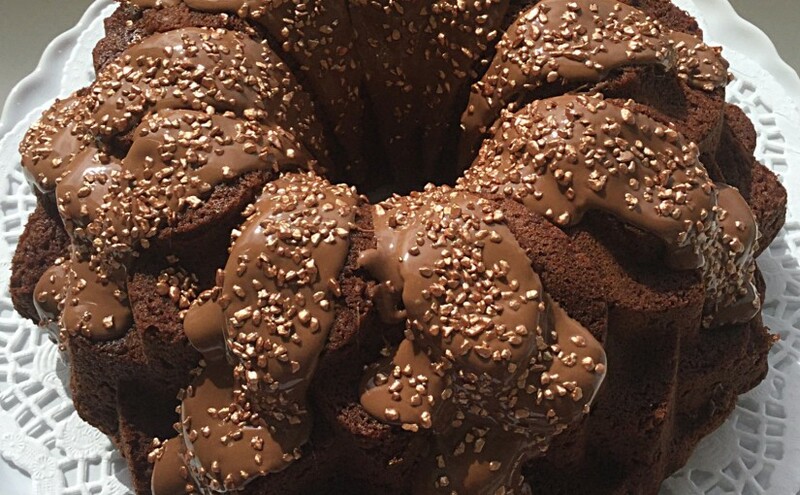 You are now ready to start building your Marbled Chocolate Bundt Cake. 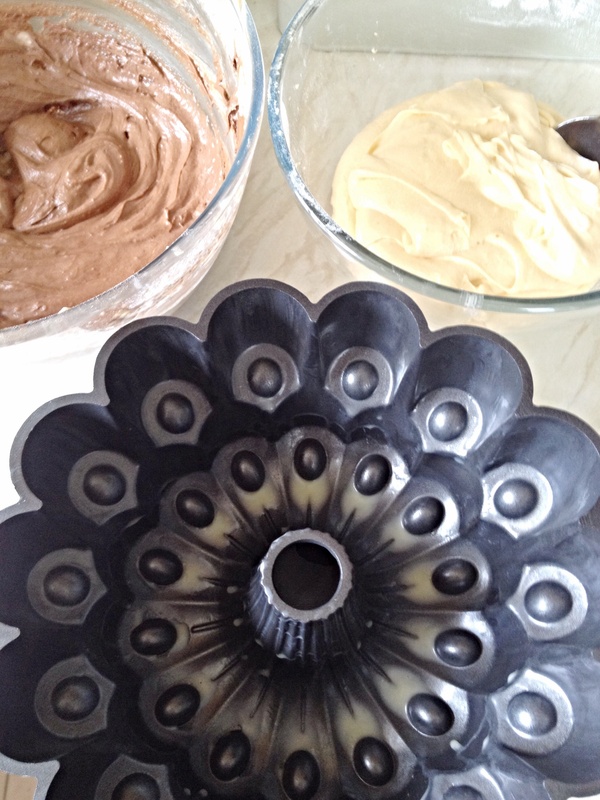 Place scoops (I used a dessert spoon) of alternating vanilla/chocolate batter into the Bundt tin. 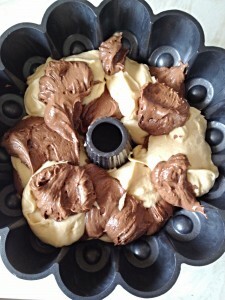 Now place a scoop of chocolate batter on top of the vanilla, repeating with both batters so they alternate throughout the cake. 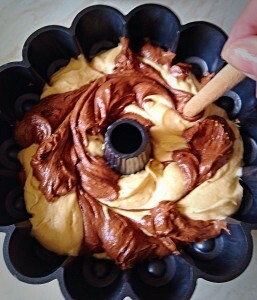 Using a wooden spoon handle, gently swirl it through the batter. This will give the marbled effect once baked. Please don’t worry if you think there is not enough batter for the pan (I worried!! ), this cake rises beautifully. 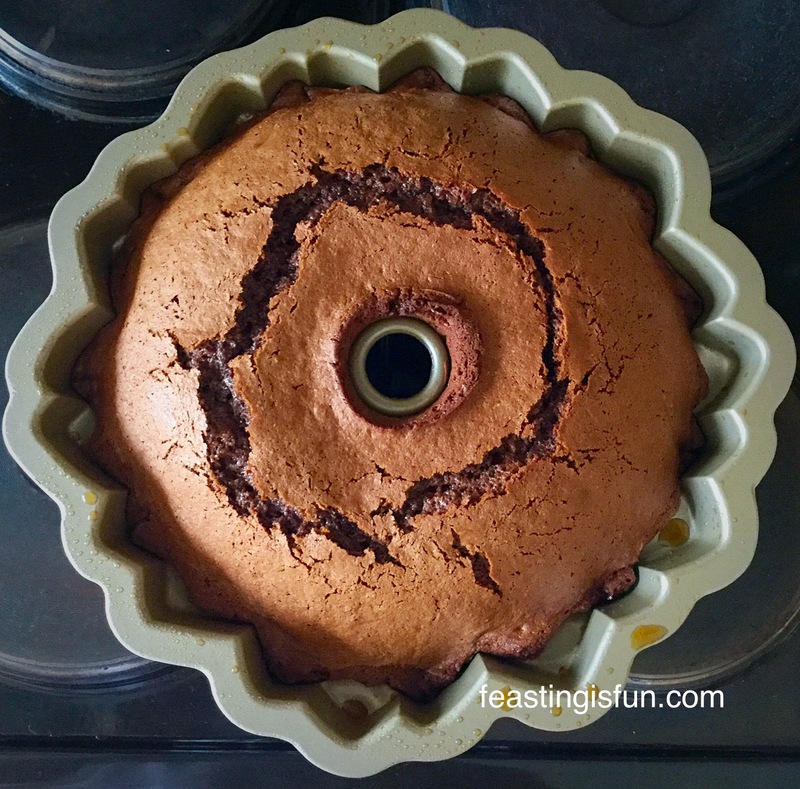 Place the cake pan in the middle of the oven and bake for 50-55 minutes. Test with a skewer (I used a bamboo BBQ one!) by inserting it through the deepest part of the cake. The cake is baked when a skewer comes out clean. 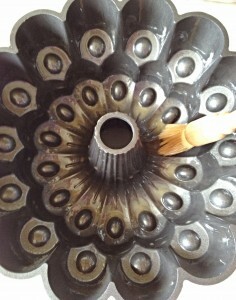 Once cooked remove the cake pan from the oven. 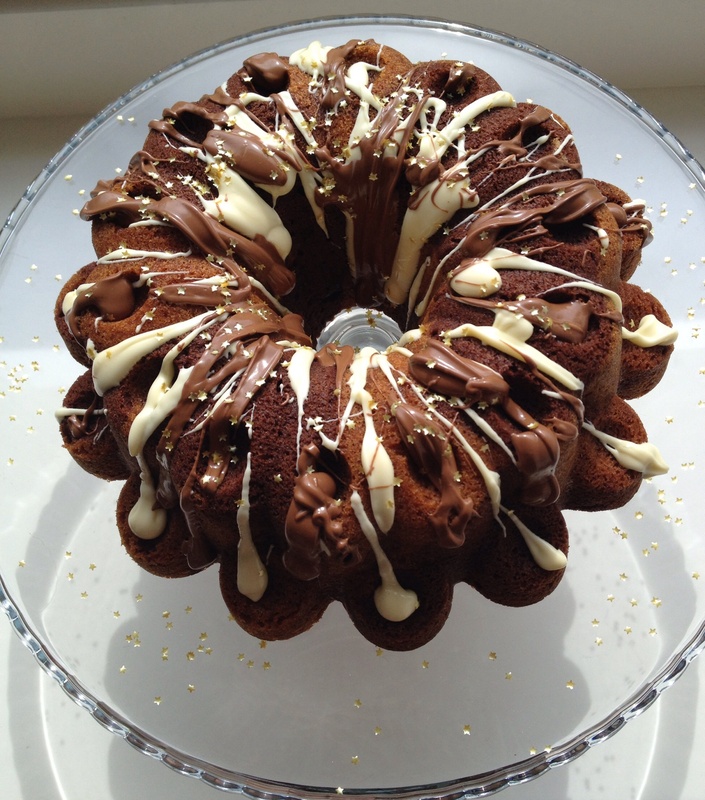 Marbled Chocolate Bundt Cake – allow to cool in the tin for 15 mins. After cooling for 15 minutes turn your cake out onto a cooling rack. Stand back and admire your beautiful piece of art, I mean cake!! Allow to fully cool. 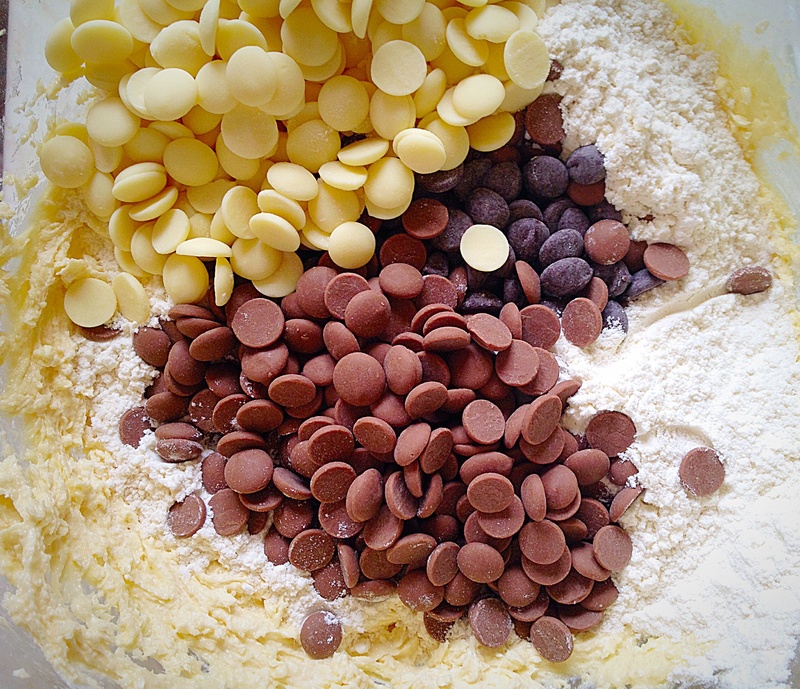 Melt the white and milk chocolate in separate bowls. I use the microwave, use whichever method you feel most comfortable with. NOTE : White chocolate is easy to over heat. So go easy on the nuking! I speak from experience!! 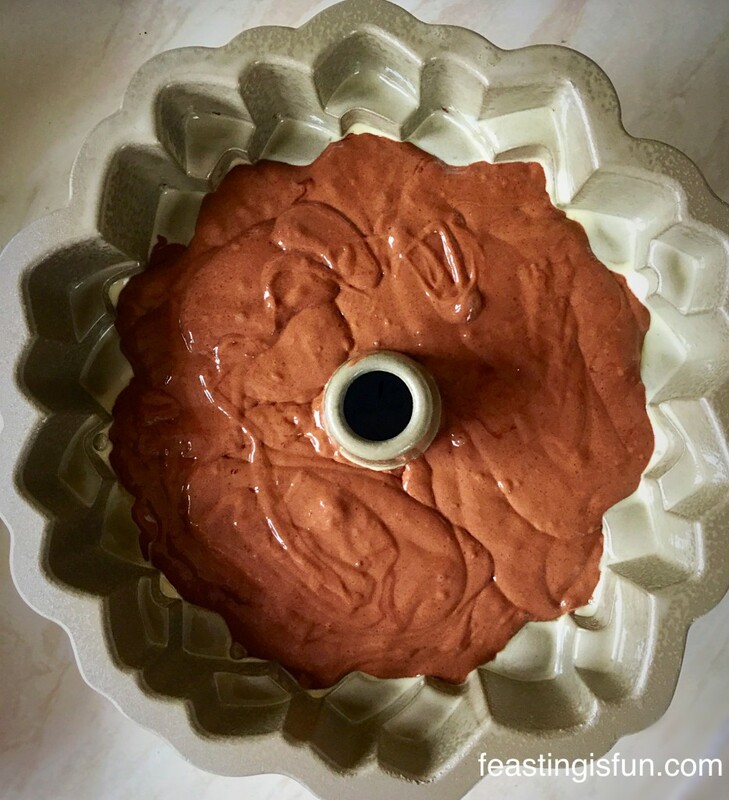 Marbled Chocolate Bundt Cake – once cooled melt the chocolate ready to decorate your cake! 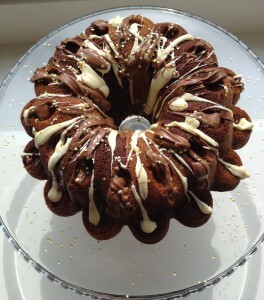 Marbled Chocolate Bundt Cake – drizzle over the melted chocolate. 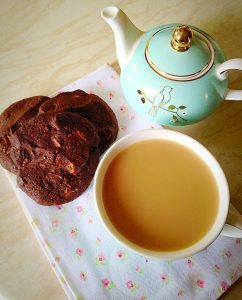 Using a teaspon gently drizzle, first the white and then the milk chocolate over the cake – soo pretty. 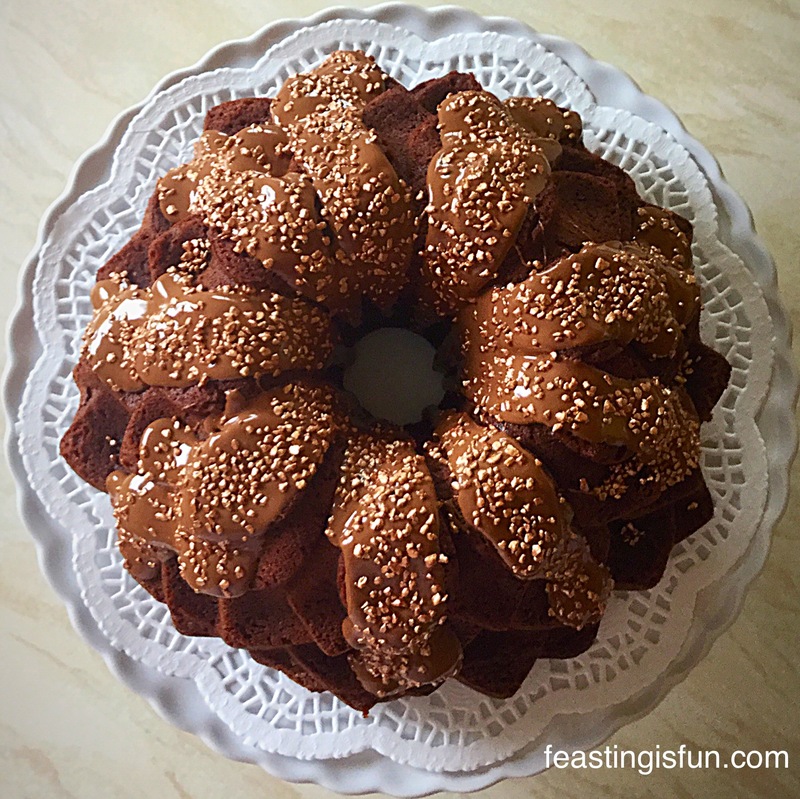 Marbled Chocolate Bundt Cake – for extra sparkle I showered the cake with edible gold stars! This Marbled Chocolate Bundt Cake is a real show stopper – I had to stop myself adding gold candles, but that would totally work. Perfect for birthdays, celebrations, get-me-through-the-day, this cake has the WOW factor and demands to be shared amongst friends, family, neighbours, work colleagues – in fact anyone would have their day brightened with the gift of this cake. Do you bake cakes to share – just because it’s a wonderful thing to do? Hi, I’m here to help put a smile on faces today. My Cheer Up Chocolate Chip Cookies are perfect for anyone who is feeling a little unwell, down or just needs a hug. 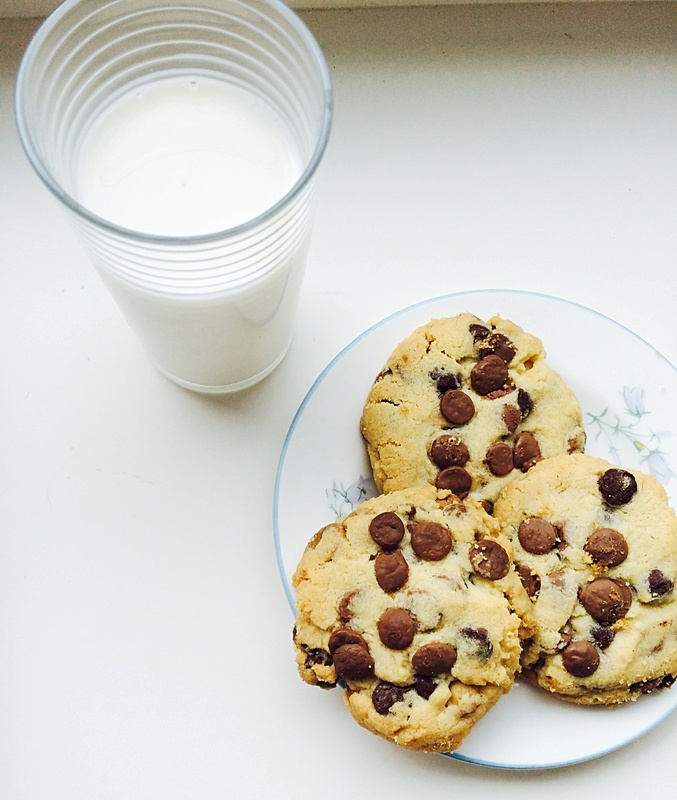 Cheer Up Chocolate Chip Cookies – perfect with a glass of milk. Our family had a BBQ over the weekend. All the cousins got together with Aunts, Uncles and Grandparents. Unfortunately I was unable to go, due to still having daily seizures. Although the children went and as always, had the best of times. Everyone had to make their own kebabs, from ingredients laid out before them and then remember which kebab was theirs once on the grill! Our children came home happy, tired and full. The next day revealed that our eldest had been bitten 30 times by Mosquitos and our other two had a fair few bites between them as well. All in all they were feeling pretty sorry for themselves. Because they were all tired and itchy and apart from administering antihistamines/cream etc. 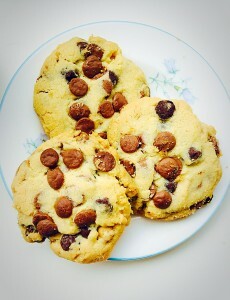 I decided to bake them these Cheer Up Chocolate Chip Cookies! 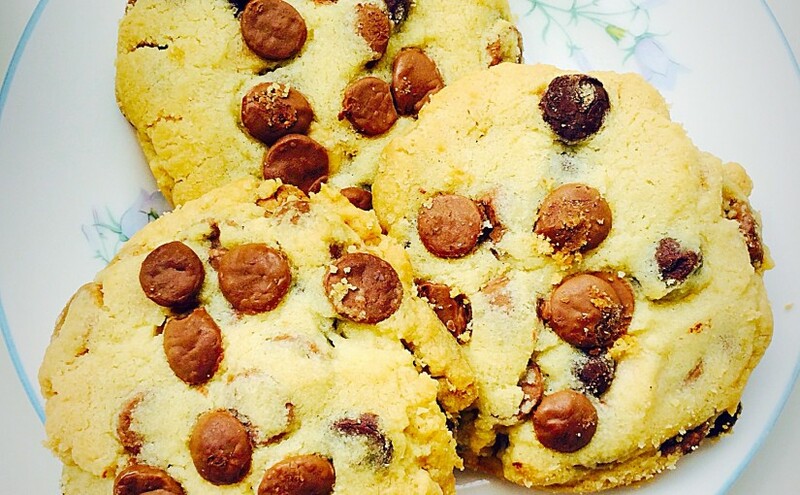 Cheer Up Chocolate Chip Cookies. Mmm these Cookies certainly did cheer the children up and although chocolate isn’t my go-to flavour, I have to say they are delicious. Hubby snaffled one after work and also agreed they were yummy, while reaching for a second one!! 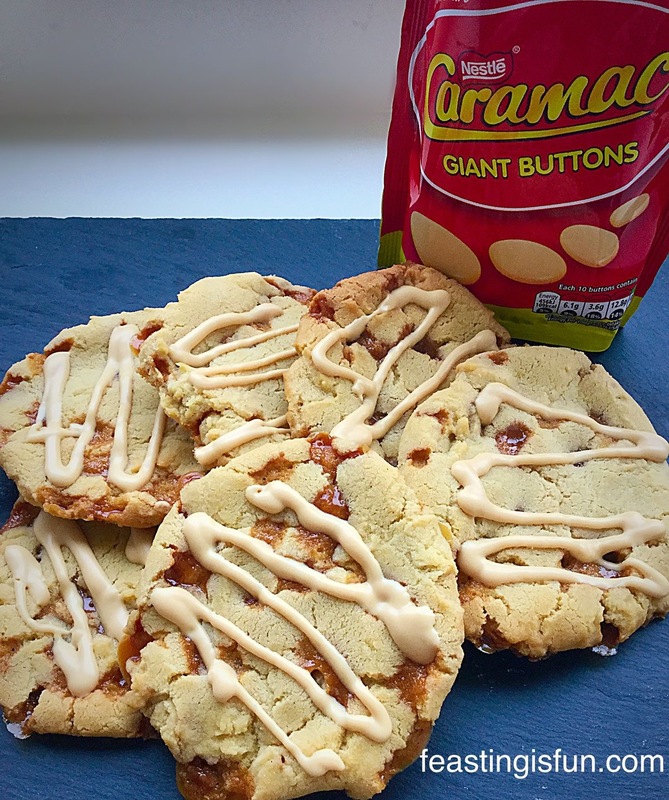 Easy to make, quick to bake, if you need cheer up food fast, these cookies are the way to go. 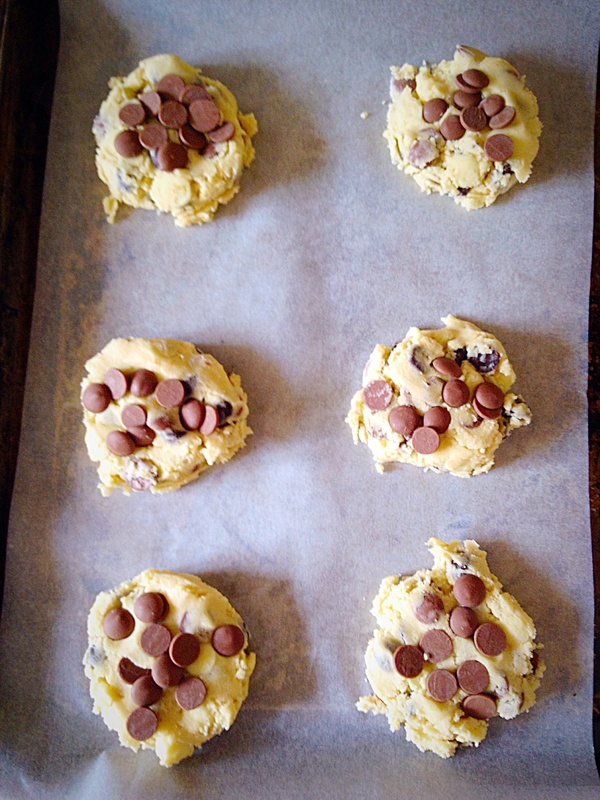 Optional – extra chocolate chips for topping the cookies. First of all line two baking sheets with parchment paper. Place the butter, sugar and salt into a bowl. Whisk until creamed together. Add the egg yolk and vanilla extract. Beat until light and fluffy. On top of the flour add the three different chocolate chips. Mix until all the ingredients are just combined. 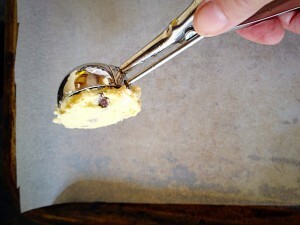 I used a 2″ ice cream scoop to measure out identical scoops of cookie dough. Identical mounds of Cheer Up Chocolate Chip Cookie dough. 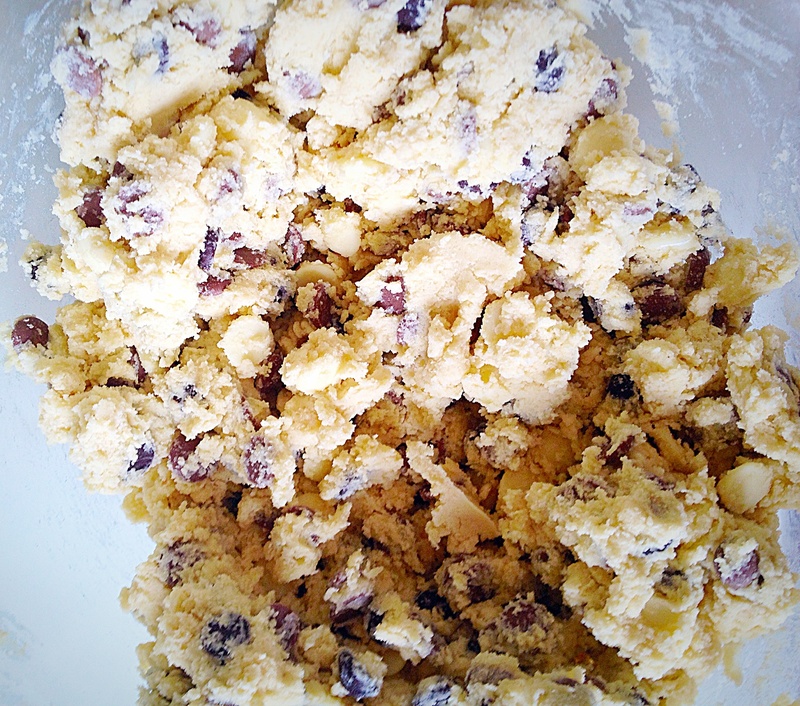 Lightly press on each mound of dough to flatten it. 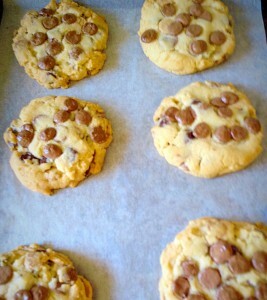 For extra cheer I pressed a few extra milk chocolate chips into the top of the unbaked cookies. Place the baking trays into the preheated oven and bake for 10-15 minutes. As soon as they are lightly golden remove from the oven. While they will still feel soft if overcooked they will be hard. 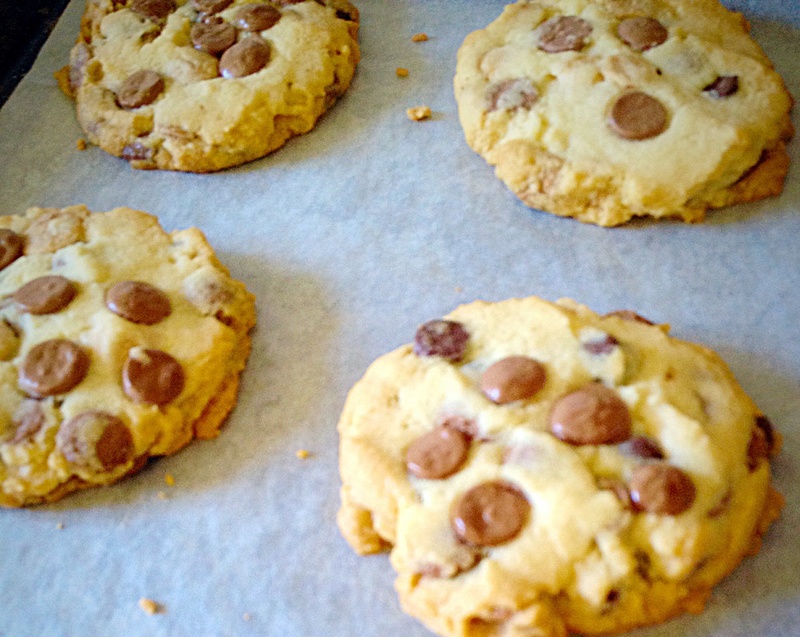 Allow the Cheer Up Chocolate Chip Cookies to cool and firm up on the baking sheet for 10 mins. Transfer to a cooling rack to finish cooling. As soon as they were just cooled the children tucked into the cookies. Since I only baked half of the cookie dough the rest was wrapped up in cling film to form a dough log. This can sit happily in the fridge for up to a week, or double wrap and pop in the freezer. 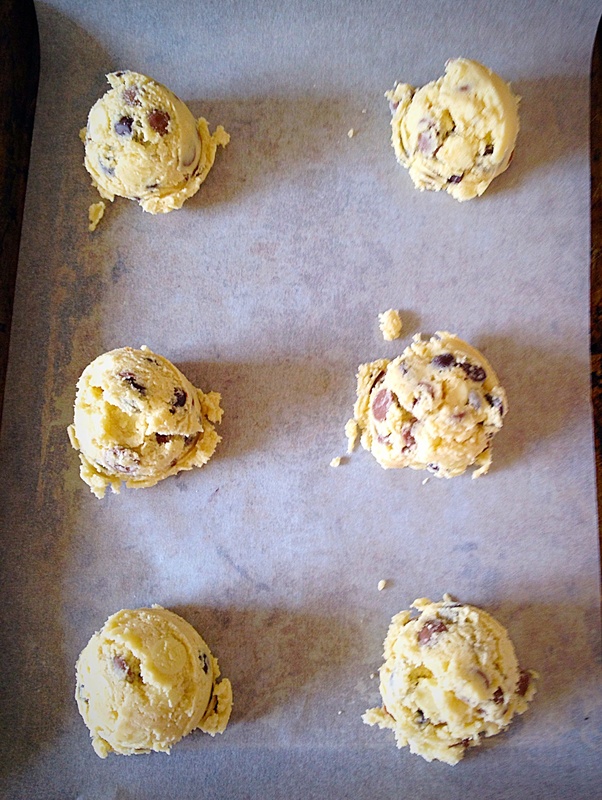 Allow to defrost and then slice and bake your cookies as above. 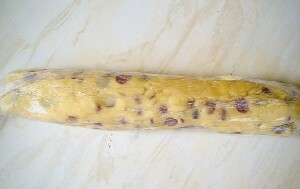 Finally, with the refrigerated dough log I find it’s best to leave it out of the fridge for 15 minutes before slicing. Cheer Up Chocolate Chip Cookie dough log. While watching the children munch on their cookie big smiles appeared. Although the itching didn’t disappear their focus was on eating. A distraction that did indeed cheer them up. Do you have a way of cheering people up?